Release Date: July 28th, 2006 (Film Forum) by Palm Pictures. The Cast: Georges Babluani, Aurélien Recoing, Pascal Bongard, Fred Ulysse, Nicolas Pignon, Vania Vilers, Christophe Vandevelde, Olga Legrand, Augustin Legrand. BASIC PREMISE: Sebastien (Babluani) enters a bizarre subculture when he follows the instructions belonging to a deceased old man. ENTERTAINMENT VALUE: The first act introduces you to Sebastien, a young man who fixes a roof and witnesses an elderly homeowner die of a drug overdose. While looking for his earned ages in the house, Sebastien finds an envelope with two crucial items: a train ticket and a list of instructions. 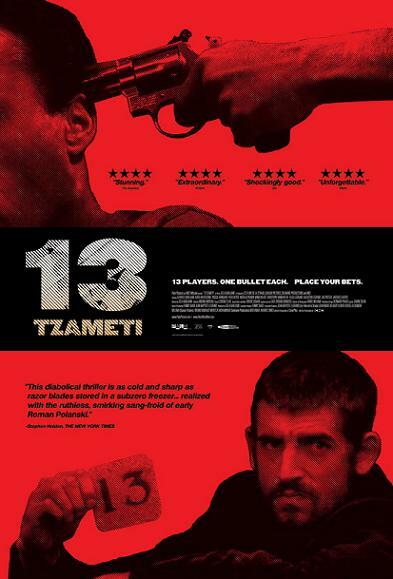 Beyond this point, 13 Tzameti turns into a rollicking ride full of unpredictable twists and turns while never seeming the least bit contrived. Stylistically, 13 Tzameti looks great in black-and-white which appropriately reflects the overall tone of the film. The musical score adds to the tension along with the editing. Writer/director Gela Babluani gradually builds up more information about Sebastien’s circumstances yet still manages to leave plenty of room for more mystery and tension. Since the audience knows just as much as Sebastien does, it’s as if you’re joining him through his discoveries of the dark, hidden subculture. Just like in the film Caché, you’ll be asking simple questions such as “who, what, where, why, how?”— some of which have complex answers. To those critics who pompously describe the plot of 13 Tzameti beyond the first act would simply ruin its many surprises and guilty pleasures which last until the very last, memorable frame. IN A NUTSHELL: A stylish thriller with plenty of twists and surprises.